The following editorial and story are take from Birth Journeys – positive birth stories to encourage and inspire. This is a series of excerpts from Natasha’s story of her journey through antenatal and postnatal depression and many other challenges. This story is found in the “Special Births” section of the Birth Journeys book. The introduction below is provided to allow readers to make an informed choice before they read this story (and any story in Birth Journeys). I am particularly grateful to Natasha for sharing her story so openly with us, as I believe it is very important for women to see that others face incredible challenges in pregnancy and they are not alone. This powerful story follows Natasha’s journey through antenatal and postnatal depression, her husband’s alcoholism, her marriage breakdown, severe placenta praevia, pelvic instability and her physical and emotional violation by a health professional. Natasha is faced with so many challenges that they seem insurmountable. It is hard to imagine how there can be any positives. Amidst all these troubles, Natasha decides that her second birth will be different. She wants to have a positive, powerful, intervention-free birth this time. She wants to feel present for the birth of her baby and to give her baby a safe and healthy entrance into the world. Birth is something Natasha feels she has some control over. Natasha chooses one-to-one care with a trusted friend who is also a midwife. This relationship is so important in bringing Natasha through the challenges and helping her to achieve the birth she wants. Her faith in God gives Natasha the strength and hope that she will make it through. In the end, Natasha has the positive and intervention-free birth she dreamt of, hoped for and planned for. This empowering experience is a beacon of light and a memory to hold onto in an otherwise dark and incredibly difficult time of Natasha’s life. The story of my second son’s birth is both positive and heartbreaking. It is intertwined with my journey through antenatal and postnatal depression and the breakdown of my marriage. The three are so woven together that it is impossible to tell one without telling the others. We were living on a station in the desert area of Western Australia. The station was run as a tourism business doing cultural awareness training for mining companies, as well as running camps for schools and youth groups. I had wanted to fall pregnant for a few months, but it hadn’t happened. We decided that the timing wasn’t right and stopped trying. We were having huge problems with our marriage. I had been feeling quite nauseous for a week or so and my period was overdue, but I had put it down to the emotions and stress of our marital problems. One morning, while my husband was in the shower, I wondered if maybe it was due to pregnancy. I did the test, and when the two blue lines appeared, I began to cry. My husband had threatened to leave for the hundredth time the night before, and I had given him a last chance to make up his mind. Now I found myself pregnant. Needless to say, it wasn’t such a happy moment. After my 19 week checkup and scan my midwife rang to say that my scan showed a low lying placenta. I would need to come back into town the next week for a checkup with the local obstetrician. I was so nervous. I looked up ‘low lying placenta’ and read all this horrible stuff about placenta praevia that left me feeling very distressed. When we went back for our checkup, the obstetrician (who had a very bad bedside manner and left me in tears!) did an internal scan. He said that my placenta was smack bang over the top of my cervix. Even if it moved, it would never move enough for a vaginal birth. He told me it was classed as grade 4 placenta praevia. He said that from 26 weeks onwards, I wouldn’t be allowed to be more than five minutes from the hospital as I could haemorrhage at any time. He also told me that I would be having a caesarean. All of a sudden, my dream of a natural birth was snatched from me. I went home and cried. The next couple of months were spent researching as much as I could about placenta praevia to see if there was anyway I could have input into the caesarean birth. I hoped I could opt to be awake rather than under a general anaesthetic. Unfortunately, due to the severity of the placenta praevia, this was unlikely to happen. To this day, I can’t explain it. It was a miracle! I have the print outs from both scans: one showing nothing but placenta, one showing nothing but baby’s head. A scan at 36 weeks showed that my placenta was at the top and front of my uterus. Again, impossible. I was stoked! My plans for a natural birth were back on track. I rang my midwife and asked if I could get the notes from my previous birth. This was one of the best things I could have done in planning for my second birth. I went over the notes with her, and now I understood the chain of events leading to my first birth. I had gone into hospital too early. I was only 3cm dilated when we arrived. I had been having contractions all night, but they weren’t very strong or close together. The midwife could have sent me home, but I think she recognised how tired and emotional I was after being up all night, and she admitted me instead. My labour was labelled as a ‘failure to progress’ and the midwife ruptured my membranes. This led to intense contractions, one on top of the other, without any further dilation. The pain was greater than I could bear, so I had pethidine. I was so heavily drugged that I felt like I wasn’t there for the birth. Even now, there are some things I can’t remember. Now I was able to go over the things I wanted to avoid this time around. I didn’t want to have my waters broken, I didn’t want any drugs offered and I wanted to stay at home for as long as possible. My midwife was completely onboard, and I was confident that any decisions she made would be in line with what I wanted. I trusted that intervention would only happen if it was truly necessary. I had no fears about the birth. I was surrounded by stories of family who had birthed naturally, and I knew that with the right support, I would be able to have a natural birth this time. My body would do what it needed to. I know that things don’t always go according to plan with birthing, but to me the actual birth seemed to be the one thing that was within my control. The rest of my pregnancy was a blur of emotions. Between my failing marriage and depression, it was one of the hardest times of my life. My husband would often leave me out on the station alone for the weekend with our first son and no car while he went into town to drink. At first I loved the isolation, although looking back now, I would say this was the beginning of my antenatal depression. I felt like I should be the happy, glowing pregnant mother, but I was far from it. I spent many nights crying, wondering how I would be able to look after my newborn baby when I could hardly look after myself. I felt nothing but impending doom. I was fearful, worried and scared that I wouldn’t be able to cope. I didn’t want to think about the baby inside of me. It was as if I tried to block it from my mind. There was no bonding with the baby, not in the beginning and not in the end. When I was finally diagnosed with antenatal depression, I was relieved. Up to that point, I had been feeling foolish. How could I have postnatal depression when I hadn’t even had my baby yet? I hadn’t heard of antenatal depression before. I was referred to counselling for antenatal depression and it helped immensely. My midwife made regular home visits (in the capacity of friend more than midwife), and I got extra support from my parents and my best friend. We stayed in the birthing room for around two hours before I finally had a shower and moved to the maternity room. This quiet time together was very important. Later, my parents came up to the hospital with our other son. He took to his brother straight away. He was calling him “My bebe” and didn’t want anyone else to hold him. Even though much of my pregnancy and my baby’s first year of life has been lost in a blur of depression, I can clearly remember those first few happy hours. There were times during my pregnancy when I had felt so bleak and in the blackest hole. Reading my bible, praying, or attending church were completely out of the picture. Often I would just cry out, “God, help me!” and that would be enough to get me through the day. I held onto the faith that God would bring me through this. I truly believe that it was God’s strength that upheld me throughout my pregnancy. We called our baby Hezekiah. It means ‘The Lord is my strength’. I felt so proud after Hezekiah’s birth. I had been supported in my decisions for the birth and had managed to give birth without pain relief or intervention. I was completely present throughout the birth and not wiped out with drugs. I learnt that I could trust myself, my body and my ability to birth a baby. I felt that even if the rest of my life was falling apart, I could share my birth story with others and be proud of it. My birth was the most positive birth I could ever have wished for, with a beautiful baby boy as a result. How could I not be proud of myself? During my dark moments, I clung to this like a person overboard clinging to a life buoy. Read the rest of Natasha’s story in Birth Journeys. Read more about antenatal depression on the Positive Birth News blog here. When you are fearful of childbirth, it affects your experience of delivery. However, recent research also shows that this fear increases your risk of postnatal depression. The study from Finland, which involved more than 500,000 women and published in the journal BMJ Open, found that women who had not previously experienced depressed mood were most likely to suffer from depression in the weeks after delivery if they feared childbirth. However, the anxiety surrounding delivery may contribute to the low mood experienced by some of us during pregnancy as well. While you probably know about postnatal depression, you may not realise that similar feelings can occur during pregnancy; you may think that any change to the way you feel is simply down to the pregnancy hormones and the other changes occurring to your body. However, a report published by the Australian Institute of Health and Welfare in 2012 showed that 3.7% of mothers experienced depressive symptoms for the first time while pregnant and other studies have shown that as many as a fifth of us may be affected by mood disorders during pregnancy. So you are far from alone if you suffer from low mood before the birth of your baby. A lot of factors contribute to antenatal depression, but worrying about childbirth and how you will manage afterwards are likely to make matters worse. Hearing about positive birth experiences will help you to feel more at ease, but if you think you might be depressed, it’s best to see your doctor. By asking you a range of questions about your feelings, your doctor can quickly assess whether you have depression and with this diagnosis they can discuss the treatments available. If you are worried about taking antidepressants, some are known to be safe during pregnancy, but a number of effective drug-free treatments are available if you have mild depression. For instance, exercise is known to do wonders for your mood and talking therapies are beneficial for many women too. If you have an interest in complementary therapies, you might like to try acupuncture, which studies show is both suitable and effective for treating depressive symptoms during pregnancy. Receiving treatment for antenatal depression, whichever treatment you choose, will help you to have a healthy pregnancy, keeping you and your baby safe. Categories: Uncategorized | Tags: antenatal depression, anxiety, fear of birth, Positive birth, post natal depression | Permalink. 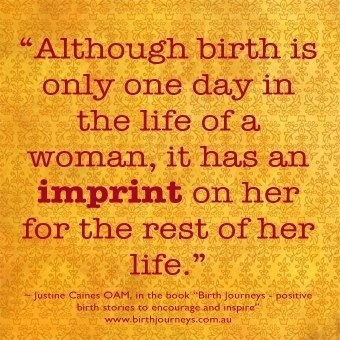 Wise words from Justine Caines OAM in the foreword for Birth Journeys. The moment of birth and the hours and days that lead up to it are dismissed by many in our society including mothers. You only need to ask your mother, your aunty, or your grandmother about her births to see the impact birth has had on her. Even as she denies the importance of birth and comments that she doesn’t know what all the fuss is about, the emotional and mental impact of her birth experiences is written on her face and betrayed in her voice. A family member told me she didn’t see why people thought birth mattered so much…and then went on to share her birth stories. She spoke of pain, frustration, fear and pressure put on her, the sense that she had failed and couldn’t give birth. Her feelings of disappointment and anger were still strong more than 40 years after her first birth. How do you have a positive birth? One that leaves a positive imprint on you? A good place to start is reading the journeys of other women who have been able to have positive births to see what is possible and learn from their stories. Birth Journeys contains 29 detailed, beautiful and powerful positive birth stories chosen with input from midwives, doulas and mothers to be. It also includes information from Australia’s midwives, doctors, doulas and birth educators including Assoc Prof Hannah Dahlen, Dr Sarah Buckley and midwife/academic Rachel Reed. The latest special is 50% OFF the ebook until Jan 2nd 2014. Download the ebook from www.birthjourneys.com.au for just $7.50 AU. What if you are reeling from a bad birth? A “bad” birth may look “normal” or “good” from the outside while on the inside it has left you feeling sorrow, pain, disappointment, anger, guilt or hurt in some way. Birth trauma can be from any kind of birth where you have felt frightened, unsupported, in danger, unheard, or violated. If a mother is hurt or cut down in the process then the birth outcome is not optimal. Reading stories of women who have healed from bad experiences, or who have explored their feelings as they have prepared for a more positive and empowering birth next time is helpful for many women. The message of Birth Journeys is “YES your feelings are valid. And healing is possible. You don’t have to feel this way forever.” You may have been let down by carers who did not keep you feeling safe, loved, respected and heard. You may have been set up for a negative birth by our culture of fear of birth and denial that birth is important for parents as well as babies. You may have been let down by a system of care that failed to provide the best care for you as an individual. Whatever reasons or lessons are revealed by your story, a different story is possible next time. Birth Journeys shares many stories from women who have walked this path too – each with a sensitively written introduction so you can pick and choose the best stories for you. A good place to begin your journey to healing and a positive birth next time is talking to Melissa and Debby from www.birthtalk.org and getting hold of their book “How to Heal a Bad Birth” when it comes out soon. Melissa and Debby also wrote a piece for the Birth Journeys book on how to heal from a traumatic birth. Categories: Birth preparation, Inspiration, Opinion | Tags: Birth imprint, Birth Journeys, birth matters, Justine Caines | Permalink. Wow! Amazing progress Russia! Certainly agree with the author though – the conceptualisation of menstruation that this is based on is not empowering and doesn’t reflect a deeper understanding of what menstruation can be. Such a revolutionary change this would be and such change it would demand in the way women are treated and the way women feel and are understood. 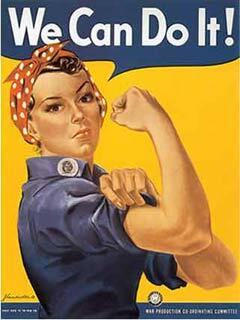 But only when it comes from women because women have changed the way they see menstruation and see themselves. Currently most women might think this was either unneeded or would result in more workplace discrimination and more making fun of women. Can’t see any of this happening under our govt in Aust for many many many moons! But I don’t think we are yet ready. So I choose to try to plan my own months around my needs and we teach our sons about these needs from a young age with an attitude of respect and acceptance. Paid Menstrual Leave – it’s time! by DeAnna L’am. Reprinted with permission. Fascinating! Lets look at how good things are turned on their heads, yet again, to result (unsurprisingly) in women’s dis-empowerment. We had planned a homebirth for the birth of our first child. At first my husband wasn’t terribly keen on the idea, but we spoke about the benefits for both of us to receive continuity of care and support by one midwife. I didn’t want to be ‘just another woman having a baby’ to the hospital staff, with my husband barely figuring in the equation. Once we met our midwife Marie, there was no going back. When I knew I was pregnant, we spoke on the phone and we talked about the need to ‘own our births’. This was important to me, because I did not want to be controlled by hospital policy. I wanted to have my feelings and wishes respected. With an independent midwife, the emotional, mental and physical welfare of myself, my husband and our baby were considered with the utmost importance. Giving birth in a hospital was not out of the question; there would be no hesitation if the need arose. But continuity of care with someone that knew us and truly cared about us was our priority and we couldn’t get the kind of care we wanted in the hospital. In the end this continuity of care is exactly what made the birth of our son a positive experience, even though his birth was everything I did not want. I started reading Ina May Gaskin’s books Guide to Childbirth and Spiritual Midwifery before I was even pregnant and they got me so excited about being pregnant and giving birth. I just wanted it to happen NOW! They were so positive and made birth seem so normal, yet monumental and incredible at the same time. Thankfully I got pregnant very easily and it was a very breezy pregnancy. I had no morning sickness, although I was ridiculously tired for the first few months and fell asleep as soon as I got home from work every day. I was fit and continued with Pilates twice a week up until the week before I was due. Watching my tummy grow was exciting and I felt great. We saw Marie every four weeks and then weekly as the due date approached. We only had one ultrasound at 20 weeks for curiosities sake, as we wanted a peak at the little person growing in there. During Marie’s visits she felt my stomach to assess baby’s position and we would listen to the heartbeat and just chat over a cup of tea. We discussed fears, hopes and concerns about the labour and birth and how we could work together to ensure we felt supported by each other. Ultimately I was really looking forward to labour and just getting to experience it all. Each appointment when she looked at my stomach, Marie would shake her head in amazement at the strange shape my stomach made; it was so lopsided! As we knew I had a bicornuate uterus uterus she suspected the baby just preferred being in one side rather than the other, but was still vertex. Indeed at 36 weeks baby was Left Occiput Anterior, textbook perfect. However, at our 38 week appointment Marie was having trouble figuring out what position the baby was in. She decided that if we were still having trouble at the 39 week appointment we would have an ultrasound to ensure we were properly prepared. So at 38 weeks and 6 days we had another appointment and baby was giving Marie a hard time again so an ultrasound was scheduled for that afternoon. During that scan we discovered the baby was transverse. Spine down, head in the right horn and feet in the left. The ultrasound also showed an exceedingly long wall (septum) extending down the middle of my uterus. It was a pretty upsetting result! That evening, Marie reviewed the scans and the report and contacted Dr Ken at the Foetal Medicine Unit in our city. He arranged for us to see him the next day. Marie would come with us. At the appointment, we had an ultrasound that confirmed what we had seen the previous day. We then had a 4D diagnostic scan which showed that the septum was not as big as first suspected and it was decided to attempt an external cephalic version (ECV) to turn baby. It was quite quick and not too uncomfortable and baby’s head moved down with relative ease. Ken arranged for us to come back and see him on the Friday to reassess. By Thursday however, I knew that baby had reverted back to transverse and at the next appointment this was confirmed. Another ECV was performed and baby again went head down with ease. But again within hours, I knew that baby had moved back! Ken was such a lovely doctor. He truly empathised with us as the situation unfolded during the week leading up to the birth. He was softly spoken and gentle and always very respectful. Not only to Tim and myself, but also to Marie, as he recognised that she was our primary caregiver. He did not to try to ‘take over’ at any stage, but consulted with Marie and ourselves at every appointment. We had another appointment on the following Monday and this time we discovered that baby was again transverse, this time with head on the left and feet on the right. I remember Ken just looking at Marie with a really sad expression and he left it to Marie as our caregiver to break the news of the need to perform a caesarean. As the due date was the Wednesday and the baby was in a very unstable lie, we decided to deliver the baby by caesarean the next day. I think all four of us, Ken, Marie, Tim and I felt pretty devastated. While we were in Ken’s office getting all the paperwork underway I asked him if he would be able to perform the operation. He told me that his shifts meant that he would not be able to. The upside that day was that we were able to arrange to have my aunty (a midwife) to be the supporting midwife in the operating theatre. Ken personally called Aunty Rozzie to tell her that I had asked for her and together they arranged for her to be in theatre as the assisting midwife. My mother also drove up to be with us for the two weeks after the birth to help. We knew that I would not be able to do much after the surgery for some time. • The theatre was to be as quiet and lights as dim as possible for the moment of birth. For the rest of the day and night I was angry and inconsolable. I sat for an hour in the bottom of the shower that night crying. I was broken hearted. Despite having a great pregnancy and positive attitude about birth, my chance to give birth naturally had been taken away. I was never to know what contractions or labour felt like. On Tuesday morning, Tim, Mum and I went to the hospital to meet Marie and our little baby. I was still angry and upset, and even refused to have Mum take a photo of me the day our baby was born, despite taking a photographic record of the entire pregnancy. When I had to change out of my clothes in triage into the surgery gown I broke down into tears in the change cubicle. After such a breezy nine months and feeling so prepared and excited to experience labour and birth, having to put on tie-up paper underwear for a caesarean section was like the ultimate smack in the face. The triage nurse was so lovely and caring though. She hugged me and told me she understood how confusing and disappointing it all was. Tim and I hung out together waiting to go in to theatre while Marie and Rozzie were preparing together. We found out that Ken had changed his schedule around just so he could be there for me. That made me feel so cared for. Once I was finally in theatre it was incredibly emotional. After the epidural was in, I found it difficult feeling so physically disconnected from the birth. I could feel my legs being manoeuvred and knew a catheter was being put it. I tried not to cry and Marie was with me, getting me to focus on her rather than the necessary unpleasantness. She was a physical, mental and emotional support the whole time. Ken, Aunty Rozzie and the theatre staff told us what was happening and constantly checked to make sure I was feeling all right. Marie was able to photograph the entire birth so I also have an incredible record of how it unfolded. Time was strange during the operation. I felt tugging and pulling. There was the buzz of all the staff in the operating theatre…and then quite suddenly a beautiful little boy was held up over the partition for us to see. No one told us what he was; we got to discover for ourselves. No one whisked him away, but instead he was placed on my chest with his face against mine. There was so much encouragement and joy from the midwives. I blew gently in his face to help him take his first breaths. I remember smelling him for the first time and it was the most beautiful creamy scent I will never forget. Aunty Rozzie then took him away to clean him up and Tim was able to cut the cord. Once he was brought back he was never taken from me again. He attached straight away and didn’t stop feeding for over two hours. Looking at the incredible photos Marie took of Don’s birth while I write this still makes me want to cry. The operation itself is quite amazing to see and I can tell Ken is grinning like crazy behind his mask as he lifts my tiny baby up for me to see for the first time. I remember constantly being asked if I was OK or if I was uncomfortable. Everyone knew what our birth plans had been, so they made sure that despite our baby having to be born via caesarean, it was as good as a caesarean could be. The birth was as caring, gentle and respectful as possible. It was not rushed, it was not an ‘emergency’ and my husband, my baby and myself were looked after to very high standards. Ken came to visit me the night after Don was born to see how I was and to tell me “You can birth vaginally next time. You will do it”! He was a genuinely caring and gentle doctor. For a long time afterwards, despite having a beautiful boy and a ‘good’ caesarean birth, I still felt like a failure. I felt like my body had let me down. I felt cheated and that I hadn’t really given birth as I did not feel a single sensation during his birth, or one contraction to let me know that my baby would soon be here. I felt let down by myself and just very confused. Some people kept telling me that I needed to “Get over it” as I was fine and Don was fine and “If you were in Africa you’d both be dead”. But Marie completely supported me in my feelings of disappointment and grief for what I didn’t get to have. She did not allow me to wallow, but she never once made me feel that my hurt was unwarranted. She let me vent and be angry and upset, but she helped me relinquish those negative feelings as well. As time moved on and I was able to talk things over with Marie, my sister who has had two caesareans and two VBACs, and other friends, I saw that it was a positive experience and one to be cherished. Even now I wish I could go back and do it again, just so I could take more of it in and see my little boy being born all over again. It was positive because I had the best care in my midwife. I know that if I had gone though the public system, or even through a private obstetrician, I would not have received the same level of support or respect that I received from her. Terms would have been dictated and I would have had little to no control over events. She was as sad and disappointed as I was that things didn’t eventuate the way we had originally planned, but she also had a positive attitude that I definitely needed as well. Despite being born by caesarean birth in hospital, Don’s birth was an amazing day that I wish I could experience all over again. We were cared for, loved, respected and consulted. He was delivered by people who loved him before he was even born; people who couldn’t wait to meet this crazy little personality that had refused to head in the right direction! His first moments were shared with our wonderful midwife Marie and his Great Aunty Rozzie. Sadly Rozzie died less than two years later, and just three days before the birth of my second child. I am forever thankful for sharing something so precious with someone so special to me. Ultimately Don’s birth paved the way for an amazing achievement: the breech HVBAC (a vaginal breech birth after a caesarean – at home) of my little girl 20 months later with Marie as my midwife. Adwen is now three months old and her big brother loves her to pieces. If Don’s birth hadn’t been what it was, her birth would have also probably been very different. Donald was born 6 September 2011, 3:19 pm, measuring 7lb 2oz (3.2 kg) and 49cm in length. Phe lives in Canberra with her husband Tim, two children Donald and Adwen, and two puppies, Oberon and Hermione. Her days are mostly spent at home looking after all four little ones, and trying to make sure Donnie doesn’t terrorise the puppies too much! She loves gardening and cross stitching and as many catch ups and coffees with friends as possible. LOA or Left Occiput Anterior is considered to be the most favourable position for babies to be in for birth. LOA means baby is on your left side with the back of their head facing towards your belly, their back is aligned with your belly. Occiput means head (specifically the back part of the head), anterior means front (your belly). Categories: Birth Stories, Inspiration | Tags: bicornuate uterus, caesarean, ECV, homebirth, Ina May Gaskin, midwife, transverse baby | Permalink. Pregnancy – a time to be celebrated, honoured, adored and adorned! I was privileged to attend a ‘baby shower’ for an Indian couple a few years ago and I was deeply moved by the incredible reverence and honour bestowed upon both the father and mother-to-be at this ceremony and celebration. 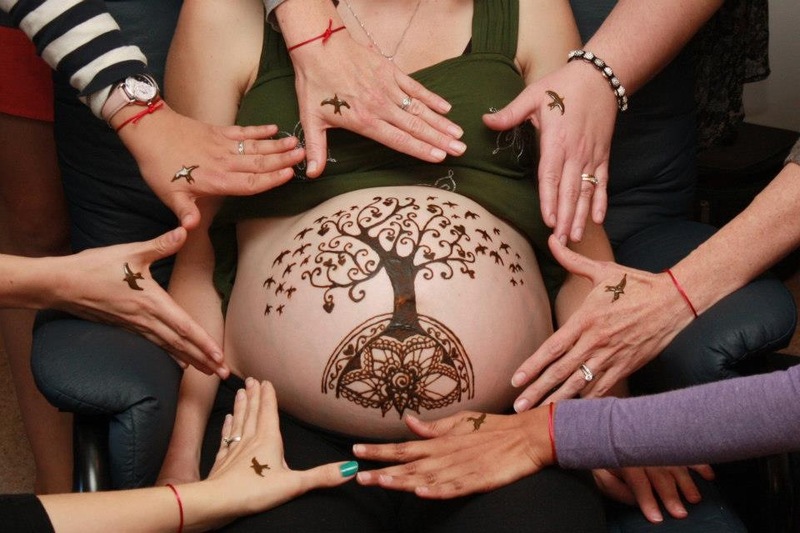 The mother-to-be was joyfully decorated with henna and brought special foods to eat and drink. There was dancing and singing, laughter, music, plenty of prayer, chanting and moments of silence and reflection. It was a momentous occasion, lasting an entire day. This special event matched the enormity of birth and becoming a family. In our mainstream western culture we do not give our mothers and fathers-to-be this beautiful and powerful preparation for birth and parenthood. Typical baby showers can be quite surface level with the greatest care given to matching invitations, party decor, fabulous cupcakes, a beautifully presented table of food and amazing gifts – all beautiful and joyful things! We tend to show our love through these kinds of details. There’s nothing wrong with a baby shower and they make women feel really special and pampered. But what if you wish for something different to this? What if you wish for a gathering that will help you to feel strong, beautiful and ready for birth and parenthood? You may choose to give yourself or a pregnant friend a celebration like a “Mother and Baby Blessing” or a “Blessingway”. It may be a baby shower with one extra element of ceremony or bonding. It may be for both you and your partner – dads need honouring and support too! One alternative or addition to a baby shower or a blessing is to invite a circle of friends to make beautiful birth art together. Enjoy an afternoon of creativity and fun making a positive, empowering and joyful memory together. If you have a doula you may wish to invite her too and she will help to establish a positive, welcoming and accepting mood. If you have a friend who understands you and your wishes for birth you may like them to help you organise this gathering and set the mood for the day. • Sculpt mothers, babies, pregnant bellies with clay. Air hardening clay is available in craft stores. • Create prayer flags for your birth with words and images. Squares of calico cloth and paint, fabric markers, scraps of material and embroidery thread are all you need. Give your friends a candle to light when they hear that you are in labour. You may like to choose one person to let everyone know by text message. There is an incredible power in the shared lighting of a candle and shared awareness that a close friend is labouring. The candle seems to focus attention and allow us to “send” love, strength and well wishes to this mother and her baby in labour. 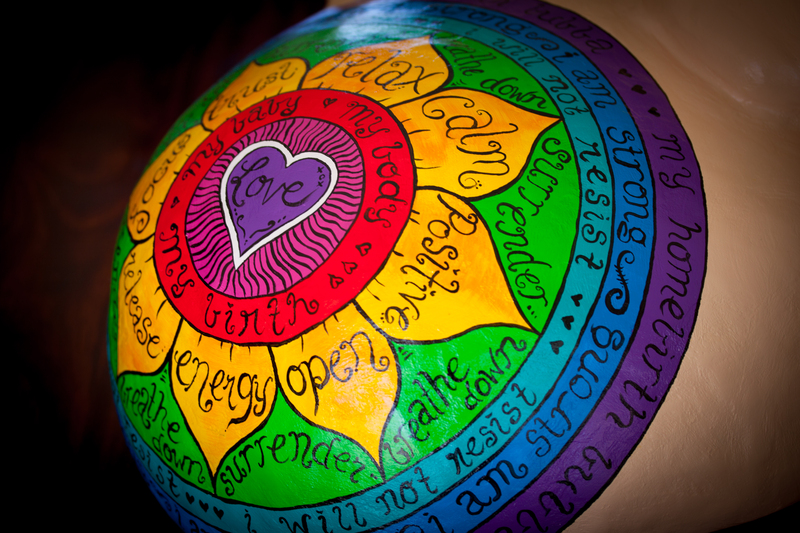 Making pregnancy and birth art is all about harnessing your creative spirit, unleashing your intuitive knowledge and tapping into collective memories to make a tangible record that we can turn to for strength, reassurance and inspiration. Just as our birth stories collect and share the memories of many so that the mother to be can take these into her mind and her memory as though they are her own; so does the sharing of art. These symbolic and deeply personal creations can feel as though they capture a little piece of each woman and her strengths, her love, her support and her conscious desire for this birth to be peaceful, welcoming, safe and beautiful. This is a powerful and wonderful gift. If this all feels too extraordinary for your circle (and I do understand! It felt a little too extraordinary when I was pregnant but I would do it now without hesitation!) then why not invite friends for a cookup instead to help make meals for your freezer. Ask everyone to bring ingredients and a recipe. Shared cooking creates a positive and connected feeling amongst you and you will benefit from this practical as well as emotional expression of support after the birth of your baby. And you never know, after a shared cookup your friends may well feel ready to embrace something more! Imagine if our culture told us that birth was one of the greatest things a woman might ever do. Imagine if the stories and images we were exposed to taught us that labour (and all birth) is an incredible and transformational experience, a rite of passage into motherhood. Our family and friends would celebrate and honour us. We would be surrounded by supportive and caring women as we embarked on this new experience. Naturally, we might feel nervous and anxious about the momentous task ahead of us, but we would be well prepared. We would believe and trust that we could do this and have the reassurance of medical assistance to help us if we needed it. With a different perspective on birth right from the start, we would enter labour ready to work with our bodies to birth our babies. We would feel excited, curious and eager for birth and all of its unknowns.” ~ from the introduction to Birth Journeys – positive birth stories to encourage and inspire. Holding a rich and meaningful blessingway or baby shower may be a wonderful and empowering step towards creating this vision of positive birth for yourself or a dear friend or sister. Categories: Birth preparation | Tags: baby shower, birth art, blessing way, Pregnancy celebrations, rite of passage | Permalink.